According to common belief, species from Lophophora, Epithelantha, Ariocarpus etc, do not like subfreezing temperatures. This is not entirely true - many varieties will survive temperatures dropping well below freezing. 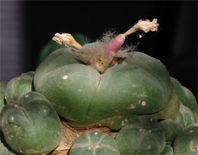 The last couple of years I've experimented with growing Lophophora, Epithelantha, and Acharagma in an unheated greenhouse, and this winter the plants had to endure temperatures below -10C (14F) for extended periods. I'm planning on growing Ariocarpus as well if I can find seeds originating from the Trans-Pecos area. 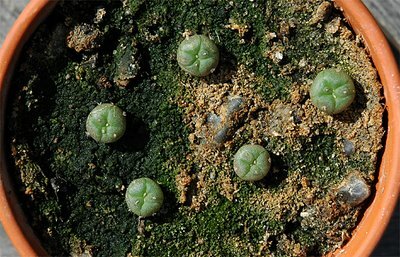 The picture above shows Lophophora williamsii (SB 854; Starr Co, Texas) plants sown May 1, 2004. After 2 years in the coldhouse the plants are thriving - more plants have been disfigured and killed by bush-crickets and other critters than by the cold. The remaining 5 plants are each 1.5 cm (~ 0.6'') wide. Last years batch of Lophophora williamsii (SB 854; Starr Co, Texas) seedlings are also doing well. The 5 plants have obtained a diameter of 1 cm (~ 0.4''). 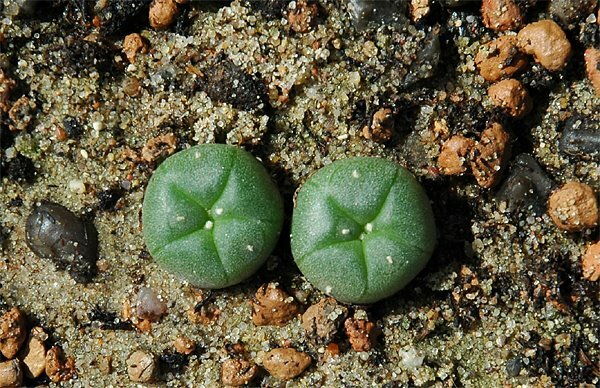 The more southern living Lophophora diffusa is not handling the cold as well - none of the plants started from seed in 2004 are left, and only 2 plants from the 2005 crop are still surviving. The L. diffusa seeds originated from plants from Higuerillas, Queretaro. The 11 Lophophora decipiens seedlings from last year are doing slightly better, but as the L. diffusa seedlings they have only grown to a width of 0.5 cm (~0.2''). 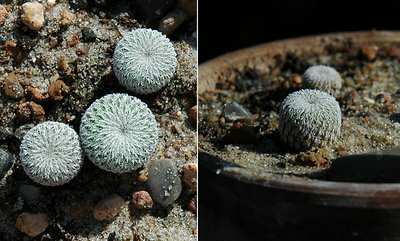 I'm growing Epithelantha micromeris v. greggii (Cuesta la Muralla, Coahuila) and Epithelantha micromeris (SB 1327, near Belen, New Mexico). The New Mexico variety is a slow grower – the 12 plants are less than 1 cm (~ 0.4'') wide – but it is handling the cold very well. The Coahuila variety is growing faster but is more susceptible to frost damage – the 11 plants are each 1.5 cm (~ 0.6'') wide. All plants were sown May 1, 2004. The Acharagma aguirreana (RSM 396; Sierra Paila, Coahuila) and Acharagma roseana (LX 578; Ramon Arizpe, Coahuila) seedlings from last year are still fairly small – less than 0.5 cm (~0.2'') in width. A. roseana seems to be better at tolerating frost than A. aguirreana; I sowed 30 seeds of each species, and 20some seedlings of each germinated. Today more than 20 A. roseana are surviving while only 3 A. aguirreana are left.